Jean-Luc Godard once said that the best way to criticize a film was to make another film. It is, perhaps, the great irony of his nearly six-decade career, then, that his work continues to be received in much the same way—with critical essays, reviews, and exegeses written and published post-haste after each film’s festival debut or, with marginally more attention, upon theatrical release. This is not to suggest that such written-word efforts fail to illuminate. But there is something odd about approaching Godard’s late work—particularly his recent collaborations with producer-cinematographer-editor Fabrice Aragno—without a corresponding inclination or means to match their radicality or experimental nature. And coming four years after the director effectively got the final word in with his 3-D masterwork Goodbye to Language (2014), the following is certainly no exception. Still, we try. Enter The Image Book, a dense, 84-minute video piece that may or may not turn out to be Godard’s swan song. Made in the style of his eight-part, decade-spanning Histoire(s) du cinéma (1988-98), it premiered at the 71st Cannes Film Festival on the 50th anniversary of May 1968, the events of which had a lasting impact on Godard’s cinema, igniting his efforts with the Dziga Vertov Group and a stated desire to “make political films politically.” The film then won a “Special Palme d’Or” (the first of its kind) from the jury led by Cate Blanchett, who described it as being “almost outside of time and space”—which is fair enough given that it might be as disjunctive and recondite as any film to have ever screened on the Croisette. 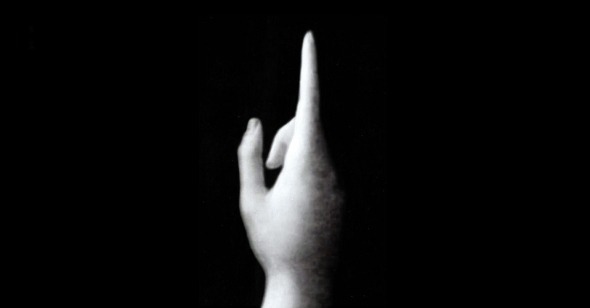 Structured around the recurring image of a hand with its index finger raised (a detail cropped from Da Vinci’s St. John the Baptist and then suspended in inky blackness), The Image Book is appropriately split into five chapters, one for each of five fingers. The first, titled “RIM(AK)ES/Remakes,” charts an endless cycle of modern human wars through images of catastrophe, from the mushroom cloud of the atom bomb to the white-hot ending of Robert Aldrich’s noir apocalypse Kiss Me Deadly (1955). Having established something of a zero point, Godard takes the viewer through “St. Petersburg’s Evenings,” tracing a line from extravagance, via an Ophülsian tracking shot across an opulent ballroom (the clip’s low-grade footage smeared and processed almost beyond recognition), to revolution, suggested by glimpses of Dovzhenko’s Soviet masterpiece Earth (1930). From here, the film segues into its most floridly titled chapter (“Those flowers between rails, a confused wind of travels”) and offers up a compendium of iconic Western images of trains—vehicles that have loomed large in the cinematic consciousness ever since the Lumières. There are clips of Keaton’s The General (1926) and von Sternberg’s Shanghai Express (1932), and even the opening of Tourneur’s Berlin Express (1948). It’s in this passage, too, that the mounting, doom-laden sense of unease suffusing the preceding chapters comes to bear. Conceptions of modernity, industry, and positivism are overwhelmed by no less than the night and fog of the Holocaust, a subject Godard has returned to over the course of his career. If, as Godard intones early on, pledging allegiance to the ideas of Swiss cultural theorist Denis de Rougemont, man’s condition is indeed “to think with hands,” then what happens when cinema subverts or displaces that tactile state? When a hand becomes, as in Godard’s famed aphorism, “not a just image, but just an image”? When real violence becomes conflated with the violence of representation? In a choice that will strike some as crass at best, and exploitative at worst, Godard continually rhymes the two, in one instance placing gruesome footage of ISIS throwing bloodied bodies into the water against the scene in Vertigo (1958) in which Scottie rescues Madeleine from the San Francisco Bay. The ultimate point that Godard arrives at here, though, is fairly direct: which is that cinema—even revolutionary, politically minded cinema—has not clarified, but obscured the reality of the Holocaust and other attendant horrors, and instead contributed to a larger confusion, an effective “flattening” of reality. (That the clenched fist of revolution is here traded in for a raised index finger is instructive.) Whether one finds Godard’s rhetoric persuasive or not, the nature of that reality, as founded on the violence and corruption of Western society (the subject of the fourth chapter, “Spirit of Law”), is harder to deny. It’s in the fifth and final movement, though, that these ideas gain their fullest expression. Named after Michael Snow’s La Région centrale (1971)—a landmark conceptual achievement that upends a craggy Québécois landscape in a series of dizzying mechanistic permutations—this chapter presents an imagistic corpus of “Joyful Arabia” that departs from Western representations such as Pier Paolo Pasolini’s Arabian Nights (1974). Excerpts of films hailing from the region itself appear alongside DV footage of coastal vistas and news clips of the Arab Spring. Accompanying the images are uncontextualized verbal passages, some of which—primarily those that speak of “Ben Kadem” and “Samantar”—are drawn from Egyptian writer Albert Cossery's Une Ambition dans le Désert, a 1984 novel about a fictitious state on the Persian Gulf previously untouched by conflict due to its territorial lack of oil. Furthering his previous argument regarding cinema’s capacity to obfuscate, Godard thus establishes a kind of alternative history that, especially for viewers unfamiliar with his chosen source texts and images and unmoored by the chapter’s departure from the Western canon, might seem like an actual one—which is as scathing an indictment of tourist-trap ignorance as one could imagine. “Can the Arabs speak?” a voice asks part-way through, an obtuse statement that here nonetheless resonates with the knowledge of how “the central region” has often been viewed. As the title card “Archaeology and Pirates” reminds us, the (Western) history of the Middle East is one of plunder and ill-gotten gain, not just of wealth (in the form of oil) but also an entire tradition of images and iconography. Expounding on the latter, Godard mulls over the contrast between the violence of the act of representation and the eerie “calmness” of the representation itself. So even as Godard constructs what is nothing if not a representation of the Middle East, he draws attention to the tenuousness of his position—which is, if not an outright rebuke, then at least self-critical acknowledgment of Orientalist impulses that go back as far as La Chinoise (1967). Not for nothing do the words “under Western eyes” recur twice, emphasizing the distance between the merely seen and truly felt. Near The Image Book’s beginning, a voice proffers, “Nothing is as handy as a text.” With reference to the Ten Commandments, the Koran, and the Torah—sacred texts that have engendered centuries of conflict—Godard later seems to ask: at what cost? And after all, The Image Book is itself a kind of (un)holy tome, a bombastic attempt at creating a definitive imagistic history. An insert of The Complete Works of Alexandre Dumas would posit that a compendium of words and letters, though certainly fraught and prone to error, is achievable. But when it comes to images, is such effort possible? Is it even desirable? By drawing attention to the mutability of the images themselves, Godard’s distinctive legerdemain would seem to suggest otherwise. Clips culled from cinema and reportage flicker and transform before one’s eyes in a barrage of changing aspect ratios, contrast levels, and color saturation intensities; gnomic pronouncements and aphorisms (some translated, others not) boom and crackle over a detailed 7.1 sound mix. Fulfilling a remark that “counterpoint is the discipline of superimposition,” frames are juxtaposed, distorted, equated and thus challenged, questioned, mistrusted. What Godard attempts here is something akin to what Michael Snow achieved with La Région centrale, albeit with an entirely different approach—that is, to reorient a viewer’s sense of space and thus defamiliarize the world anew. After all, images of war, violence, and destruction are things we should never have gotten used to in the first place; Godard’s project merely restores the requisite sense of disquiet. In a diatribe against the “bloody morons” running the world, Godard asks: “Why dream of being king, when one could dream of being Faust?” If the storied director’s own deal with the Devil was “a transmutation of reality” over the course of a prolific career, then his latest is both the fulfillment and fallout of such a bargain—an attempt to grapple with what it would truly mean for a region, a history, an entire reality to be distilled into a set of images compiled for “handy” perusal. Twisting the knife somewhat, Godard makes his case against such ends while locating genuine beauty within them. There are two images here as magisterial as any in Godard’s long career: of luminous coastal waves floating across the frame, backed by an emerald-clear sky; and of a rolling lakeside vista of astonishing blue, with a sky-full of cumuli reflected over a hyaline-clear expanse. It's no coincidence that both are images of water, a motif that recurs in Goodbye to Language as the embodiment of the nothingness (and thus the purity) of nature, unencumbered by man. So how then are we to take The Image Book? Brecht’s dictum that “in reality, only a fragment carries a mark of authenticity” is as close as the film comes to a definitive answer, positing an atomized view detached from a broader determination. This may be more confounding and uncertain, but perhaps more truthful to the pluralities of the world as it exists. For just as Goodbye to Language acknowledged—no, embodied—our inability to function without the structures (symbolic, semiotic) and hierarchies (ideological, cultural) that make up our specific existence and which come part and parcel with language, The Image Book does so with a visual lexicon of which cinema is but a part. Godard merely foregrounds his individual preoccupations with cinema and the Middle East—that is, how he views the world—instead of the human fact of stereoscopic vision to make this broader argument. After all, how else does one experience the world if not as negotiated by the specificities of one’s existence? To hold otherwise would be fraudulent. Entirely fitting then, that the closing excerpt, taken from the first episode of Max Ophüls’s Le plaisir (1952), observes an old man donning a mask of youth and taking part in a breathless, doomed quadrille. Here one recalls the director’s maxim: “Life is movement.” The man collapses; the screen cuts to black. Still, we try.